In Catholicism, the Last Rites prepare a sick person for death. In the Catholic religious tradition, there are specific rituals and prayers to bring comfort to the sick and, if needed, help prepare a terminally ill person for death. Catholics believe that death is the departure of the soul from the body, but that both body and soul belong to God. The treatment and care of the dying, the dead and their bodily organs is guided by this belief. Among the consecrated rituals are the Last Rites, or Sacrament of Extreme Unction, better known as Anointing of the Sick; praying the Holy Rosary with a focus on the Sorrowful Mysteries; praying the Divine Mercy Chaplet and directing prayers to St. Joseph, patron of the dying, for a peaceful death. Sometimes called Last Rites or Extreme Unction, referring to the use of oil, this ritual may be performed only by a priest. It begins with a rite of atonement, followed by the Liturgy of the Word, consisting of scriptural verses. The sick person, along with relatives and friends, pray to Jesus Christ for the gift and strength of his Holy Spirit. The priest gently lays his hands on the ill person's head. He then anoints, with the sanctified Oil of the Sick, the person's forehead and hands, while reciting a prayer for God's mercy. This sacrament can be repeated for the sick or dying and may also be carried out before serious or life-threatening surgery. A three-part prayer ritual, the Litany of the Saints is an invocation of the Holy Trinity, Virgin Mary and the Saints, calling out to them by name. The litany opens with a call for mercy to the Holy Trinity -- the Father, the Son and the Holy Spirit -- as one God, asking Christ to hear the prayer. Next is a plea for the intercession of the saints, the first of whom is the Virgin Mary, followed by other important saints in descending order of significance. Another appeal for mercy follows, specifying the ills that afflict the person seeking recovery. The litany closes with more suppliant prayers and recognition of the humility of those praying. 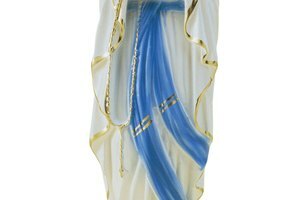 The Holy Rosary is a meditation on the lives of Christ and the Virgin Mary. Each decade, corresponding to 10 rosary beads, represents a mystery. Prayer includes reflection on these mysteries. There are three sets of five mysteries -- the Joyful, Sorrowful and Glorious Mysteries. For the sick and dying, only the Sorrowful Mysteries are the contemplative focus. 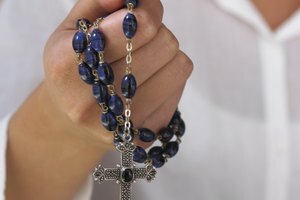 Often the Holy Rosary begins with a statement of intentions, as in praying for someone's health. After kissing the crucifix and making the sign of the cross, there are recitations of the Apostles' Creed, Our Father, Hail Mary, Glory Be and Fatima Prayer, followed by meditation on the Sorrowful Mysteries. 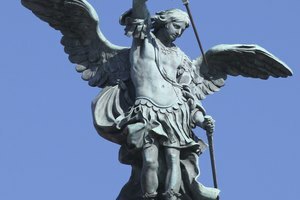 The Holy Rosary may conclude with the Salve Regina, prayers for the Holy Father, the Litany of the Blessed Virgin Mary and/or prayer to St. Michael. The Divine Mercy Chaplet is another set of prayers using rosary beads. The Chaplet begins with two prayers from the Diary of St. Faustina, the apostle of Divine Mercy, followed by a closing prayer. After making the sign of the cross, there are recitations of Our Father, Hail Mary, the Apostles' Creed, the Eternal Father and Holy God, along with optional opening and closing prayers. Among the prayers to St. Joseph is the Prayer for a Happy Death. There are two similar versions of the prayer, one of which states: "O Blessed Joseph, you gave your last breath in the loving embrace of Jesus and Mary. When the seal of death shall close my life, come with Jesus and Mary to aid me. Obtain for me this solace for that hour -- to die with their holy arms around me. Jesus, Mary and Joseph, I commend my soul, living and dying, into your sacred arms. Amen." Leigh, Shannon. "Catholic Rituals for the Sick or Dying." 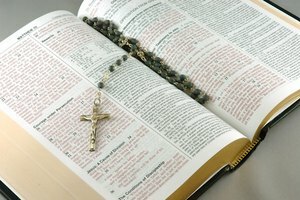 Synonym, https://classroom.synonym.com/catholic-rituals-sick-dying-5575.html. Accessed 20 April 2019.